When you leave home, can you ever really come back again? That’s what Elaine Neil Orr explores in her new novel SWIMMING BETWEEN WORLDS (Berkley Trade Paperback Original; On sale April 3, 2018), set in 1960’s Winston-Salem, NC. The daughter of missionaries, Orr spent parts of her childhood in both Winston-Salem and Nigeria, her memories serving as inspiration for the events of the novel. Local golden boy and high school football star Tacker Hart left his home in North Carolina a hero, having gone on to NC State to study architecture. After graduation and despite his parents’ concerns he accepts a prestigious assignment in West Africa to help build a university. However, after he is fired and returns to Winston-Salem in disgrace, he has no choice but to make ends meet by managing one of his father’s local grocery stores. He has a changed view of his seemingly idyllic hometown after his time abroad; the culture and people he grew to admire have left their mark on him. At the same time down the street, recent college graduate Kate Monroe is back at her parents’ home, still grieving over the recent deaths of both of her parents. While cleaning, a trove of disturbing letters sends her searching for the truth behind the comfortable life she's been bequeathed. Soon both Tacker and Kate encounter a young African-American, Gaines Townson, and their stories converge with his. As Winston-Salem is pulled into the tumultuous 1960s, each find themselves at the center of the civil rights struggle, coming to terms with the legacies of their pasts as they search for an ennobling future. A perfect read for fans of The Help and The Secret Life of Bees, SWIMMING BETWEEN WORLDS is a Southern coming-of-age novel that explores how changing viewpoints can alter people’s lives and their communities. 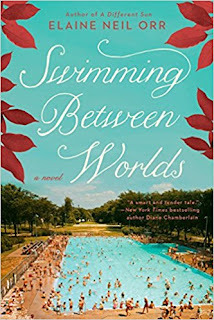 I love Southern literature, especially story lines that are historical, and Swimming Between Worlds is one of my favorite books this month! Orr's characters are relatable and memorable. They are so well-developed and it's very easy to slip deeper into their world with each page. This novel places the reader at a tumultuous time in America's history and is written with both power and grace. This compelling novel is an absolute beauty and I highly recommend you put it on your must-read list this Spring!